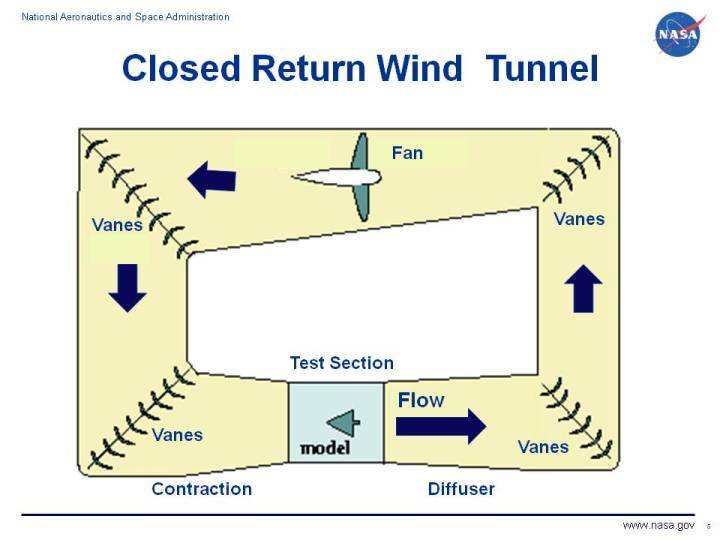 On the figure, we show a schematic drawing of an closed return wind tunnel. This type of tunnnel is also called an Prandtl tunnel, after the German engineer, or a Gottingen tunnel , after the research laboratory in Germany where the tunnel was first used. Many of the large research wind tunnels of NASA are closed return tunnels. In the closed return tunnel, air is conducted from the exit of the test section back to the fan by a series of turning vanes. Exiting the fan, the air is returned to the contraction section and back through the test section. Air is continuously circulated through the duct work of the closed return tunnel. The arrows on the figure denote the flow of air through the wind tunnel. In the other major tunnel design, the open return tunnel, air that passes through the test section is gathered from the room in which the tunnel is located. Closed return tunnels may operate subsonically, as shown in the figure, or supersonically, as described on a separate page. Supersonic closed return tunnels are more complex than subsonic tunnels. To prevent condensation in the test section because of low pressure, the air entering the tunnel is often passed over a dryer bed. There is usually an additional throat placed in the tunnel downstream of the test section to shock down the supersonic flow to subsonic. The advantage of a supersonic continuous flow wind tunnel is the longer run times relative to a blowdown tunnel. The major disadvantage is the increased size and operating costs. The closed return tunnel has some advantages and some disadvantages relative to the open return tunnel. Superior flow quality in the test section. Flow turning vanes in the corner and flow straighteners near the test section insure relatively uniform flow in the test section. Low operating costs. Once the air is circulating in the tunnel, the fan and motor only needs to overcome losses along the wall and through the turning vanes. The fan does not have to constantly accelerate the air. Quiet operation relative to an open return tunnel. Higher construction cost because of the added vanes and ducting. Inferior design for propulsion and smoke visualization. The tunnel must be designed to purge exhaust products that accumulate in the tunnel. Hotter running conditions than an open return tunnel. Tunnel may have to employ heat exchangers or active cooling.